The Arkansas Union houses many resources available to students, staff and faculty. One of the resources that the building offers is Union Hair Care. The salon is located on the second floor of the Union, in the room 207. 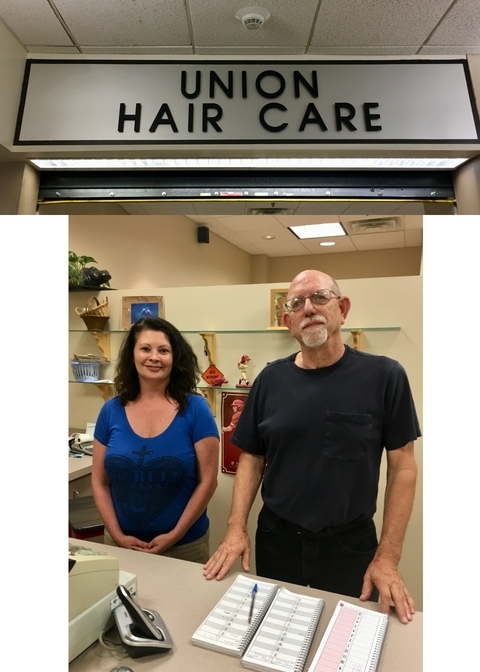 The Arkansas Union wants to give a shout-out to David Furr, who has worked at the Arkansas Union Hair Care for 43 years. He first started working in May of 1975 and has been working in the building since then. When asked what his experience has been like over 43 years, Furr said: "I absolutely enjoy working here, that is why I have been here for so long. I feel very fortunate to have found a place like this. I have always preferred working here on campus because you get a chance to meet people from all over the world." Furr also said that building has changed a lot since 1999 when the Eastern side was added. He says that some of his most fun memories were made prior to 1999, when the second floor of the building was the "hub" area of the Union with the food court and recreation area available to students. He also said that the Arkansas Union has improved a lot since then. These days, Brandy Bemrose and Manuel Whitmore are helping Furr with running the hair care at the Arkansas Union. When asked if he has any favorite hair styles, Furr responded: "Me and my staff are willing to do any hair cut customers would like to get and we love all of them. It is better for us if we can see a picture of what customers want to get exactly." If you want to make an appointment at Arkansas Union Hair Care, please call 479-443-4848. The salon is open 8:30 a.m. till 5 p.m. Monday through Friday.